Furman BlueBOLT-CV1 NETWORK INTERFACE CARD DJParts - All Variety of Parts that DJ Needs. 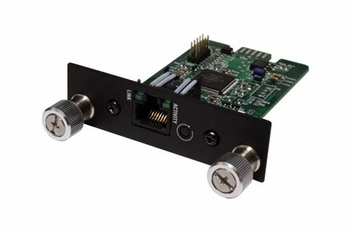 Your Gateway to BlueBOLT The BlueBOLT-CV1 Interface Card plugs in to select Panamax/Furman products and provides access to BlueBOLT™ cloud based remote power management technology. Each BlueBOLT-CV1 card includes a unique MAC address and identification number allowing you to create a BlueBOLT account or add a compatible unit to an existing account. Look for the BlueBOLT logo The BlueBOLT-CV1 works with any BlueBOLT-Compatible Panamax or Furman product.